A dysfunctional Oklahoman family gathers for a funeral. Unable to put up with his bigoted pill-popping wife, Violet (Streep), any longer, alcoholic Beverly Weston (Shepard) takes his boat out to sea and commits suicide. Arriving for the funeral are the couple's three daughters; Ivy (Nicholson), Barbara (Roberts), accompanied by her separated husband Bill (McGregor) and pot-smoking 14-year-old daughter Jean (Breslin), and Karen, who has brought along her new fiancee Steve (Mulroney). Violet's sister Mattie (Martindale) also arrives, along with her husband Charles (Cooper) and idiot son Little Charles (Cumberbatch). Over the following days, family secrets and tensions spill to the surface. August: Osage County is the latest slice of Cheddar Cheese Chekhov from the bizarrely acclaimed playwright Tracy Letts. Here he adapts his Pulitzer Prize winning play, resulting in a screenplay that's all play and no screen. Should you choose to attend a screening of the film blindfolded you won't miss a thing. Thanks to Letts' amateurish writing and John Wells uninspired TV style direction, the story telling is conveyed almost completely through dialogue, terrible dialogue at that. Apart from the early fate of a character, not one plot point is related to us through visual means. 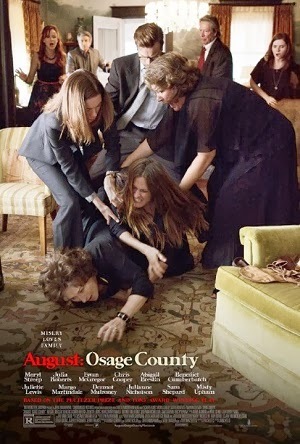 The gathering of an extended clan is a concept a film-maker like Robert Altman could work wonders with but August: Osage County is another blunt black-and-white tale of white trash Southern stereotypes from Letts. The playwright doesn't so much write character studies as caricature studies. The cast of this film can be described in simplistic terms: pill-popper, pot-smoker, alcoholic etc. While Altman would focus more on the situation than the characters, Letts and Wells opt to hone in on the populous of their piece. The problem is the cast is too large to allow for any real character development so instead we get stereotypical short-cuts. Too much of the script is exposition, characters desperately trying to convey background information to the audience through unrealistic and unnatural dialogue. There are more plot revelations in two hours here than an entire season of Dynasty. None of these "shocking" plot twists carry any dramatic weight, though, as they revolve around characters we have no investment in. There's little point dropping an emotional bomb on your protagonist if your audience has spent scarcely more than ten minutes in their presence. We may as well have been told that one of the family members was really an alien from a distant planet for all the impact the film's myriad revelations have. There's no question that Streep is a great actress but all too often she opts for showy roles that require something closer to mimicry than acting. Violet is arguably the worst role she's ever taken and comprehensively her worst performance. Coming off like Anjelica Huston playing Bono in drag, it's an unparalleled low point in a generally stellar career. Conversely, Roberts delivers what could well be the performance of her life, though it helps that she's playing the only character in the film that feels like anything approaching a real person. During one of the film's many shouting matches, Juliette Lewis tells Roberts that "most of us live in the middle". Letts should listen to his own character as in his works nobody lives in the middle, everyone is a stereotypical extreme.